A year after the traumatic Belgian race the F1 teams gathered again at Spa with a few changes from the Dutch Grand Prix three weeks previously. Innes Ireland, who had broken his leg at Monaco, was back in action for Team Lotus, which had new Lotus 21s for Ireland and Jim Clark. Ferrari had a fourth car painted up in Belgian racing yellow for Olivier Gendebien, which was being run by Ecurie Nationale Belge, which also had a pair of Emeryson chassis for Lucien Bianchi and Willy Mairesse. These were both damaged in practice and so Bianchi and Mairesse took over the non-qualified Lotus 18s on Tony March and Wolfgang Seidel. BRP was also in trouble with only one Lotus 18 to be shared by Cliff Allison and Henry Taylor. The team decided that the fastest driver would race. As a result Allison went too fast, crashed heavily, rolling the car and suffered severe leg injuries which would end his F1 career. Phil Hill took pole with Wolfgang Von Trips alongside while Gendebien made the most of his local experience to take third despite using a less powerful engine than the factory Ferraris. 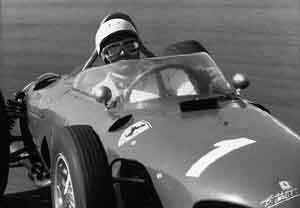 Ritchie Ginther's Ferrari shared the second row with John Surtees in Reg Parnell's Cooper-Climax. Hill took the lead at the start but was then passed by Gendebien while Von Trips and Ginther joined the fun. The lead changed several times before Hill took the lead from Von Trips and Ginther. Gendebien was fourth giving Ferrari a straight 1-2-3-4 result. Surtees was fifth although he had to battle early in the race with Graham Hill's BRM which eventually went out with electrical trouble. Dan Gurney finished sixth in his Porsche.